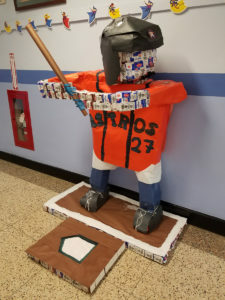 Bell Top students created this José Altuve statue using 718 re-used empty milk and juice cartons. Former Tri-City ValleyCat José Altuve is having a pretty good fall. The Houston Astro second baseman won the league batting title, the MVP award and a World Series ring. And now, he’s been honored with a recycled milk and juice carton statue at Bell Top Elementary School! Students at Bell Top re-used 718 empty milk and juice cartons to create a baseball player for the Made By Milk 2017 Carton Construction Contest. The theme of this year’s contest is sports and the people’s choice winner will receive $2,500 for their school. Bell Top’s “Altuve” statue is wearing an orange Astros jersey and in a batting stance in the school’s front hallway. Click here to vote for Bell Top’s milk carton statue! Voting ends December 9.